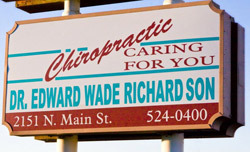 In the event of an AFTER HOURS EMERGENCY, patients of record may call our regular office number, (575) 524-0400. Please leave your name, a brief message and your telephone number. Press 1 1 2 and hang up. Your message will be transferred to Dr. Richardson’s pager and you should receive a call within the hour. Should Dr. Richardson be out of town, our voice message service will give the name and telephone number of the “Doctor on Call” for our patients. After hours office visits will include a trip fee of $50.00 added to the fees for the services performed at that time.